Phenylalanine is an essential amino acid that must be supplemented through diet. As a building block of protein, phenylalanine is changed into tyrosine that helps the brain stay balanced. Deficiencies can effect brain chemicals such as L-dopa, epinephrine and norepinephrine, the thyroid, mood, concentration, memory, appetite and behavior. Those born with a disorder known as PKU, or phenylketonuria, have a buildup of phenylalanine due to a metabolic predisposition that prevents them from using it for energy. Phenylalanine is found in many foods and generally does not warrant supplementation except in special circumstances. Before taking any supplement, consult with a health professional. Proponents of supplemental D-phenylalanine suggest that it is useful in treating chronically painful conditions. For example, Life Extension, a neutraceutical company, promotes the use of DL-phenylalanine supplements to block pain receptors in the brain, to initiate the body's own analgesic processes and to reduce inflammation. D-phenylalanine is a synthetic form of this amino acid created in a laboratory. According to University of Maryland Medical Center, the two known studies that examined the role of D-phenylalanine supplements for pain were positive in their results but lacked scientific reliability. The effects seen with using phenylalanine for pain were similar to those from the placebo groups. The two remaining forms, L-phenylalanine from protein food sources and DL-phenylalanine, which is a combination of the synthetic and protein food source, have not been thoroughly evaluated. Parkinson's disease is a degenerative medical condition that includes symptoms related to rigid movements and stiffness, difficulty walking or standing, speech problems and depression. D-phenylalanine has been used both as a supplement and as a basis for medication prescribed for those with Parkinson's disease. According to Integrative Medical Arts Group, DL-phenylalanine and phenylethylamine may improve symptoms of both Parkinson's and the depression that occurs with the disease. However, it should not be taken with L-dopa, phenylethylamine or selegiline, which are pharmaceuticals used to treat the same symptoms. Depression is a chronic condition in which low mood, feelings of worthlessness, sleep disturbances and similarly debilitating symptoms can deprive the individual of experiencing pleasure or functioning at a level to perform daily tasks. 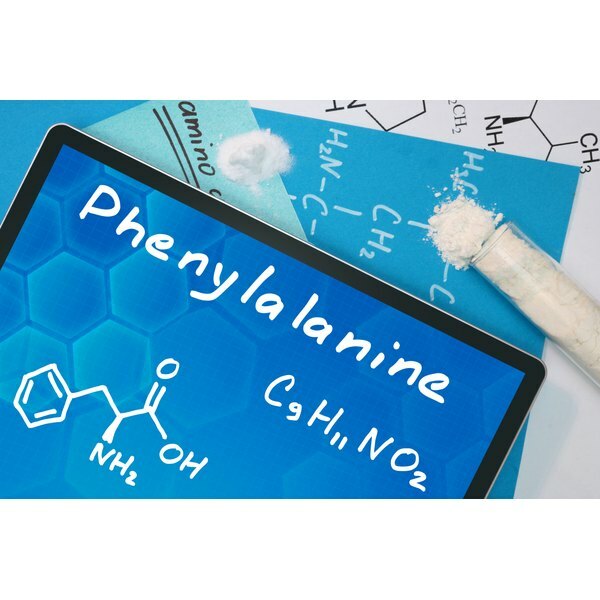 When phenylalanine was examined in the treatment of depression, Tufts Medical Center reports, both D and DL forms of phenylalanine were shown to be as effective as the antidepressant imipramine. According to the report, 60 depressed patients were either administered 100 mg of D-phenylalanine or a dose of imipramine daily for 30 consecutive days. While they both worked equally well at reducing the symptoms of depression, the D-phenylalanine showed marked improvements after just 15 days, rather than several weeks for the imipramine. Pigmentation disorders such as vitiligo, or patches of white skin and discoloration, may also benefit from the use of phenylalanine supplements. Research database Health Notes Online suggests the use of L-phenylalanine while patients are undergoing ultraviolet radiation therapy. Results of several clinical trials indicated that the effective dose for supplementing patients during treatment is about 3,500 mg per day at a weight of 150 lbs. This method may increase the effectiveness of the ultraviolet radiation therapy and may help promote the return of pigmentation in the treated area.